It’s safe to say that hamburgers have come a long way since their origins on ships bringing German immigrants to America in the 1850s (at least we had the decency to cook them, huns). We can all agree that the whole cooking-the-meat thing is vital, but after that, things become a matter of taste. Fried or grilled? Good ol’ American cheese, or something a bit more... well, nuanced? Topped only with a smear of mustard, or piled high with a barrage of toppings? Whatever style you prefer, you can find a superior example of it in the Alamo City. 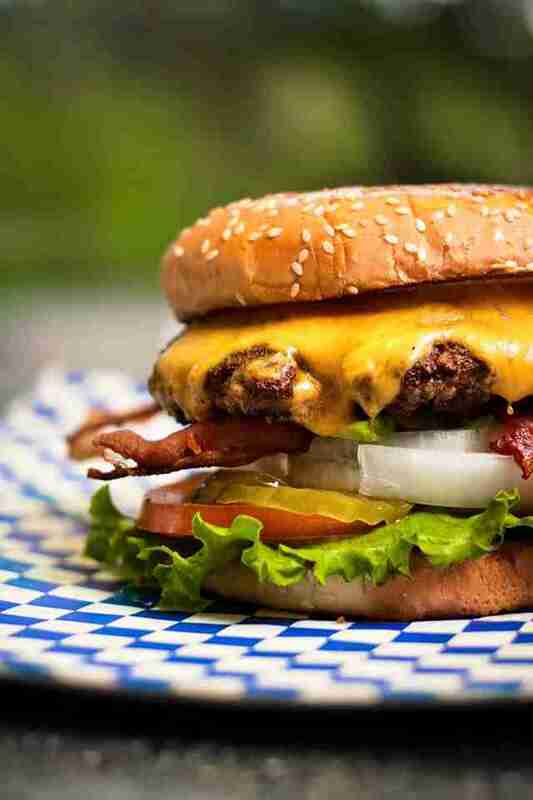 These 17 spots may differ in the details, but each puts out a damn tasty burger. Feel free to choose a different side, as the beans with the Original Fatty’s Burger are free to enjoy while you wait for your food. A bit odd, perhaps, but it works. 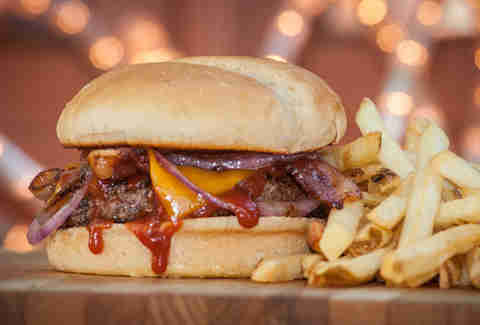 So do the thick, juicy burgers, served on a house-made, slightly sweet bun. Feeling especially bold? Give the ice cream burger -- yep, topped with fried ice cream -- a try. Made with the restaurant’s signature sauce -- a heady concoction of garlic, onions, spices, and six varieties of peppers -- the Flats burger is spicy without being aggressive and pairs nicely with sweet potato fries. The patio is great for large groups; throw in some live music and few margaritas, and you’ve got the makings of a pretty great night. If your grandpa says things like “I used to get a cheeseburger for a dollar, and they were worlds better than the crap you’re buying today for three times as much,” take him to Burger Boy. Everything about it is old school, from the look of the place to the price and the burgers themselves. 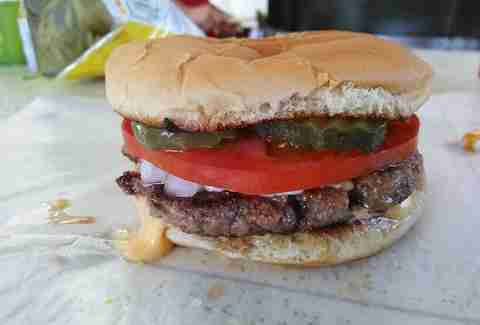 Like at all old-style burger joints, the patties are thin, which is why a double is in order. 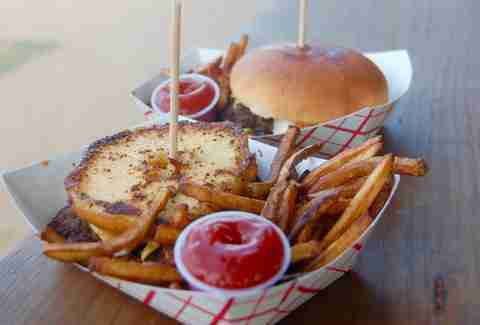 Seating is limited, but unlike its counterparts on this list, Burger Boy has a drive-thru. The Fritos-, salsa-, and refrieds-topped bean burger with avocado slices and green chiles is not for those with digestive issues. But if you can stomach some heavy-duty flavors, the payoff is worth it. 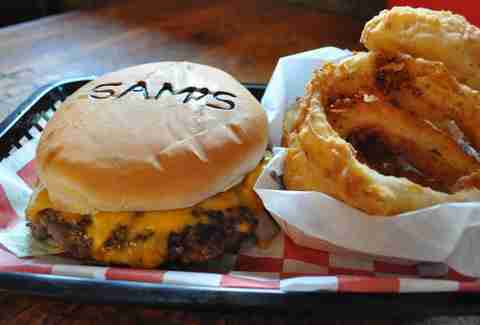 The burgers are great, but what really sets Sam’s apart is the atmosphere. It’s an under-the-radar music venue with an eclectic array of genres on the calendar and a cool, laid-back vibe. The menu is simple and there are bars on the windows, but the burgers are juicy perfection. Want fries? Too bad -- they’re not on the menu. Want ‘em to turn up the A/C? Not gonna happen because there isn’t one. You won’t miss these accouterments, though, thanks to the friendly service and simple, old-fashioned burgers made from scratch every time. Have the double cheeseburger with jalapeños, a can of Dr. Pepper (or BYOB), and chips. The menu at these sibling-owned joints is small, but Fattboy makes up for this by being big elsewhere. We’re talking big portions -- unless you opt for the Slimmboy, Slimmfries, and Coke in a Slimmcup -- and big cheese. Oh, the cheese -- orange and melty all over everything. The beer list is pretty notable as well, and the hand-cut fries are the final component in a substantial and satisfying meal. Sure, you could opt for the $32, 4-and-a-half-pound Mighty Gonzilla burger with cheese, but that might prove to be a bit heavy for lunch. Instead, honor San Antonio’s other early settlers -- you know, the Germans -- and try the Bavarian patty melt, a third-pounder with Swiss, sautéed onions, sauerkraut, and mustard. It will leave you wondering why sauerkraut isn’t a burger option everywhere. The simple Cheddar Cheezy is a great option, but only if you’ve already tried the Tostada Bean Burger (which is like a Frito pie on a bun, or maybe more like the glorious end result if you could successfully mate a burger and nachos). Chris Madrid’s is an SA institution for some very good reasons: consistent food, a welcoming atmosphere, and friendly service that makes even first-time diners feel like regulars. Time to get fancy. The Cove has a fiercely loyal following thanks to its locally sourced ingredients and how at home you feel every time you eat there. Lamb, bison, and brown-rice patties are offered, but the ‘09er is made with grass-fed beef topped with goat cheese, pesto aioli, roasted red peppers, spring greens, tomato, and onion. It’s a thoughtful take on an American classic and a great example of what The Cove is all about. Sure, the neighborhood isn’t pristine, but you’re buying a burger, not a house. There’s a huge outdoor dining area with mismatched furniture, so finding a table is not a concern, even when the restaurant is teeming with its usual military-heavy crowd. Neither is going away hungry, as these half-pound burgers are absolutely ginormous. It doesn’t skimp on toppings, either, so when you ask for jalapeños, be ready to commit. It doesn’t get much more divey than Joe’s, but that’s OK. What they’re not spending on interior design and advertising... well, they’re not spending on kitchen equipment, either, because that’s ancient. There’s nothing fancy about Joe’s -- no secret spices, no gourmet side dishes. What you’re getting is a burger akin to those made 40 years ago -- simple, straightforward, made from scratch, and at a rock-bottom price you won’t believe. Ambiance? Not so much. But you won’t care when you taste these burgers. Old-fashioned is an apt description, as are “filling” and “budget-friendly.” Service is consistently fast and attentive. In short, Candy’s gives you everything you could want in an old fashioned burger -- it’s greasy, cheap, addictive, and served with a smile. Roadrunners hoping to avoid the freshman 15 need to steer clear of Carl’s, a popular fixture at The Block SA food truck park adjacent to the UTSA campus. Unruffled by fat and calories? Consider the toasted Krispy Kreme bun and go for broke with your Crazy Carl Burger with cheese, grilled onions, and seared jalapeñosl, alongside Cajun fries. It’s so worth the splurge. When people in, say, Paris imagine how Americans eat, the picture they get in their heads is of Longhorn Cafe and the Original Big Juicy. It’s an order-at-the-counter spot for big, messy food that hits a few specific boxes. Big portion? Check! Deep-fried or otherwise gloriously greasy? Check! Doused in gravy, condiments, or sauce of some kind? Check! It’s a carnivore’s nirvana. It's tempting to doubt a restaurant that focuses on pizza, burgers, and tacos, but while Orderup might seem gimmicky, its ABC burger proved us dead wrong. 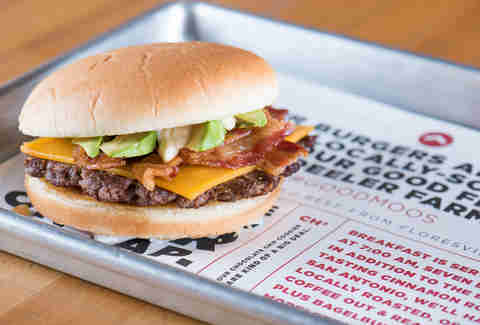 Loaded with avocado, bacon, cheddar (hence the name), lettuce, tomato, and onion, this thing has a perfect combination of flavors and textures, and deserves a plaque at city hall. 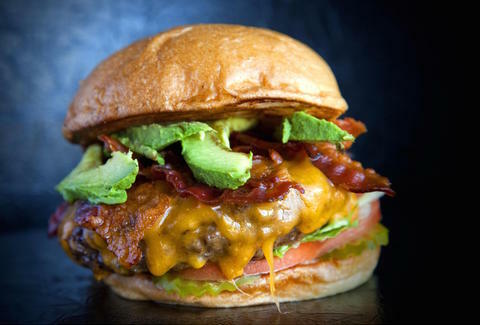 Let it be known: Avocado and bacon should always find their way on top of a burger patty together. Pro tip: Order it with fries and a light beer. Yeah, it's a chain, but the beef here is ground in-house, the buns are baked fresh, and this iconic burger belongs in your stomach. 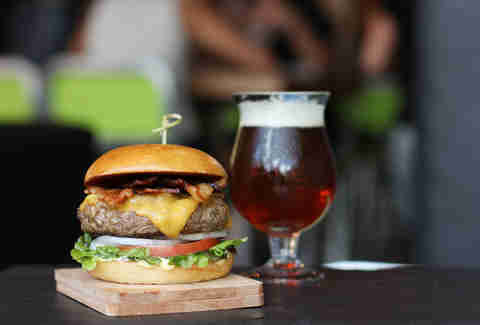 Even though the menu is wildly diverse, Hopdoddy's Classic burger is the strongest item on a menu full of all-stars: topped with always fresh lettuce, onion, tomato, bacon, cheese, and the special "sassy sauce," it's a perfect food specimen. Don't be intimidated by long lines -- Hopdoddy is efficient, and the service is fast. If a burger joint serves its soda in Styrofoam cups with a little mascot in a chef's hat and a red, white, & blue color scheme -- you know the food is exceptional. 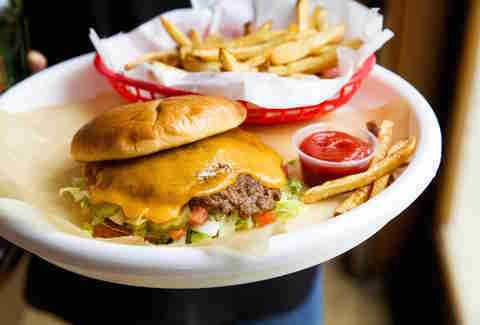 Griff's has the right accoutrement and one of the best burgers in SA -- creatively named the regular cheeseburger. Cooked on a flat-top, it's crusted with a flavorful char and topped with thinly shredded lettuce, melted American cheese, onions, and tomato. Make it a combo for an extra buck. Michelle Burgess is a San Antonio writer. Follow her @MishiBurg. Stephen Ross writes about all things San Antonio. Follow him to post-work libation liberation on Twitter @stephen__ross.